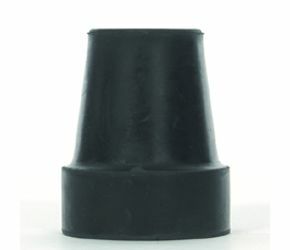 Ferrules-Black Heavy Duty (Pair) Two Sizes Available. These ferrules have circular grooves on the base for grip and a steel washer insert. Much better on my walking stick than my previous ferrule, which did not last long at all. Very pleased so far. An excellent and easily fitted replacement for a split & worn ferrule. Web site esay to use, ordering no problem, delivery as promised. Can't ask for more.